Newburyport/Rockport Commuter Rail construction will impact many passengers this summer. The MBTA has announced additional bus service to help accommodate North Shore commuters. This new schedule is the result of collaboration with and feedback from passengers, community leaders and elected officials. 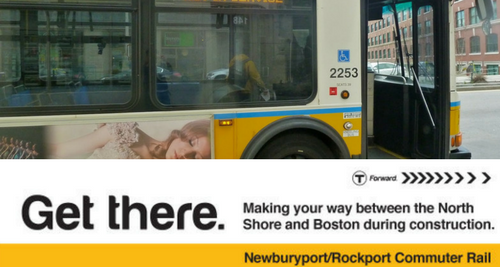 Alternate weekend shuttle bus service along the Newburyport/Rockport Lines will make stops at all stations (including Chelsea, Lynn, and Swampscott) during federally mandated Positive Train Control (PTC) installation during weekends beginning July 8 through September 30. The MBTA will also provide alternate weekday shuttle bus service along the Newburyport/Rockport Lines to each station north of Salem during Beverly Drawbridge construction beginning July 17 through August 13. From Saturday, July 8, through Sunday, September 30, weekend Newburyport/Rockport Commuter Rail service will be unavailable and replaced with alternate shuttle bus service making stops at all stations (including Chelsea, Lynn, and Swampscott Stations) on the line between Boston and Newburyport as well as Boston and Rockport. Roundtrip fare on the alternate weekend shuttle bus will be $10 with Zone 3 monthly passes accepted to and from all stations. Weekend shuttle bus schedules and more information are available here. From Monday, July 17, through Sunday, August 13, weekday Newburyport/Rockport Commuter Rail service will be unavailable north of Salem Station to allow for the Beverly Drawbridge replacement project. Bus shuttles will replace Commuter Rail service between Salem and Newburyport and Salem and Rockport, making stops at each station. Weekday shuttle bus service is free with Zone 3 monthly passes accepted at all stations north of Salem Station for the months of July and August. Weekday shuttle bus schedules and more information are available here. Weekday and weekend shuttle buses will include free WiFi and restroom facilities. Bicycles, including folding bikes, are prohibited on all shuttle buses during all service hours. Parking will be free at all available station lots north of Beverly Depot Station (North Beverly, Hamilton/Wenham, Ipswich, Rowley, Newburyport, Montserrat, Beverly Farms, Manchester, West Gloucester, Gloucester, and Rockport).” Passengers should not drive to and/or park in Salem, as station parking is very constrained. Parking will be strictly enforced in downtown and neighborhood areas. For more information on PTC installation, the Beverly Drawbridge Replacement Project, and shuttle bus service, please click here.